Take equal parts Piet Mondrian and Joan Miró and blend until smooth, and I imagine you'd wind up with the art of Jean Dubuffet. When I lived in Pennsylvania in the late 1970s, this one stood just inside the main entrance of the Sarah Scaife Gallery, Pittsburgh's excellent art museum, and it was my favorite for 20+ years  until, in 2001, Becca and our friend Lynne and I clambered all over a gigantic black-and-white walk-on Dubuffet on the grounds of the Kroller-Müller Museum in the Hoge Veluwe National Park in Holland. Art you can play on  now that's fun! 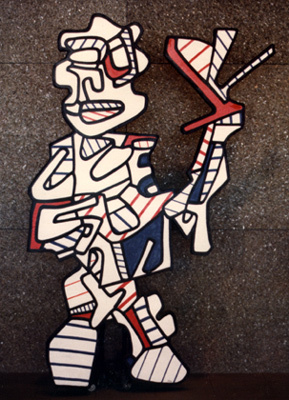 Learn more about Dubuffet here.